The emergence of digital means for instruction and associated resources has transformed education, especially in the last decade. 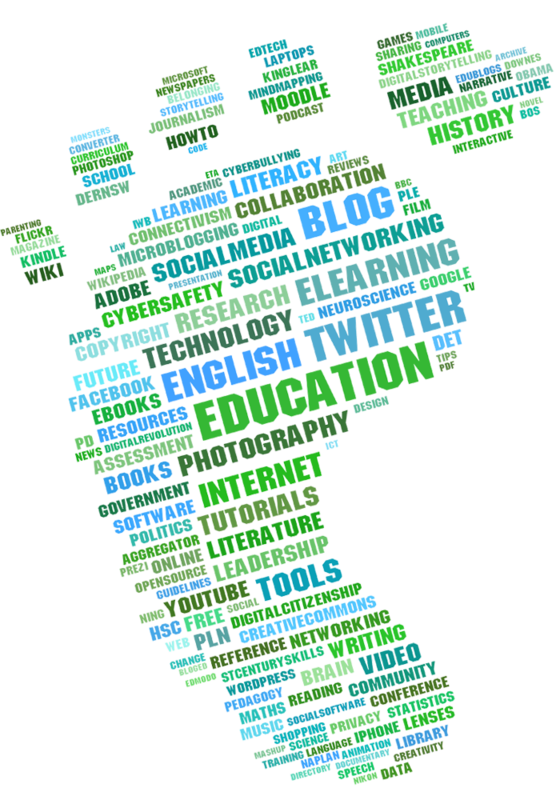 A digital footprint is the information contained through online activity of one particular person. Today’s high school students do not have the mindset nor the skill to use social media in a positive way. This has become increasingly evident in today’s high schools. But are students really to blame? How can we expect teenagers to use social media in an appropriate way if they are not taught how to do so? Both educators and parents have a responsibility to teach students digital citizenship and assisting students in the development of their digital footprint. Finding the balance of allowing and encouraging students to utilize social media in education and at the same time providing guidelines for proper use can be challenging. The reality is that most of today’s high schoolers simply do not have an awareness of online etiquette. By approaching this issue through a focus on five strategies, we can begin to properly prepare high school students for college and the future. Students can “improve” their digital footprint by beginning with a simple task, the Google search. Encourage students to do this to “see what the world sees.” Scrolling through the first few pages of a search will provide not only commonalities associated with the student’s name, but also provide students with what their future employees see about them. High schools need to find creative ways to teach digital citizenship. Whether this be through classroom teachers, through advisory programs, or by bringing in presenters on the topic, something needs to be done. A student’s digital footprint is often based upon connection to their friends and social media apps based on interest. The academic piece is often missing. Educators should teach students how to use social media for academics. Creation of digital portfolios can serve as a positive segway in encouraging students to develop an understanding. Also, students should be provided with tools to begin to connect with people in their field of interest. Developing a professional blog, website, Twitter account, “about.me” page, and other forms of social media in high school prepare students for college and nurture an understanding of digital citizenship. In addition to the common saying, “think before you post,” and the reinforcement of the golden rule, students should also be encouraged to ask this question: “Would you post this if your grandmother was reading it?” Educators can only do so much in terms of the instruction of digital citizenship, so the hope is that students develop an awareness over time. Teachers need to develop connections with students to personalize the learning. Mathematically, students spend only a quarter of their day in school. The rest of their time is monitored by their parents or guardians. Teachers already struggle to deliver the necessary curriculum, so the small amount of time devoted to digital citizenship needs to make a big impact. A lot of what happens at home on social media makes its way into school. Students who utilize tools learned in school will be more adequately prepared for potential issues at home. Parents should be involved in a partnership to not only monitor online behavior, but also to communicate with teachers, counselors, and administrators. A school climate committee can provide parents with information and resources to assist students to understand their “digital identity”. Google Alerts, a notification service that alerts changes in content within a search. When new results come online, the user receives an email when the user’s name matches the search term. Students will be able to see “who’s talking about them”. This not only provides information that contributes to a digital footprint, but also adds to the developed awareness of the student. Digital footprints are reminders for today’s high school students to use social media both appropriately and for academic purposes. By using the strategies described above, along with many others, a foundation can be built. By developing an awareness as educators by teaching the skills related to digital citizenship, our students will be able to understand its importance and eventually model for their peers. With parental support, students will be further guided in the development of their digital footprint.